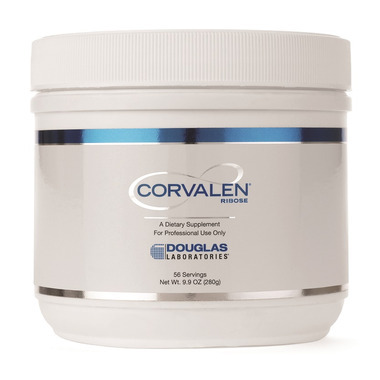 Douglas Laboratories Corvalen® contains pure D-ribose, a pentose sugar that supports the way our bodies produce adenosine triphosphate (ATP), the energy currency of the cell. D-ribose is a safe and clinically researched ingredient designed to provide athletic support by regulating fatigue, energy production and mitochondrial function. This slightly sweet D-ribose powder is highly soluble, and rapidly and readily (~95%) absorbed into the body, with peak blood levels found within 30 – 45 minutes. Our bodies must have an adequate supply of nucleotides to form major cellular constituents, such as our genetic material, cofactors, vitamins and importantly, ATP. Ribose is the starting point for the synthesis of these fundamental cellular compounds and the availability of ribose determines their rate of synthesis. Ribose is formed naturally via the pentose phosphate pathway. This pathway is slow and rate-limited in cardiac and skeletal muscle due to an inherently low concentration of the enzymes glucose-6-phosphate dehydrogenase and 6-phosphogluconate dehydrogenase. Administration of exogenous ribose bypasses the rate-limiting steps in this pathway, resulting in a significant acceleration in nucleotide and ATP formation. D-ribose is indicated for sports and fitness activities because it helps reduce the loss of energy during stress, and accelerates energy and tissue/muscle recovery. D-ribose may also support proper heart function and healthy stroke volume during and after intense exercise. Thus, it helps to maintain performance and promote endurance in extended, high intensity exercise.